Pharmacognosy is the branch of knowledge concerned with medicinal drugs obtained from plants or other natural sources. This has been critical to drug development and exemplified by the recent ward of the Nobel prize for medicines to the Chinese scientist Youyou Tu (a pharmaceutical chemist) (link) who is famous for discovering artemisinin used to treat malaria. BBC reported that she found that an extract from the sweet wormwood plant Artemisia annual was sometimes effective – but the results were inconsistent, so she went back to ancient literature, including a recipe from AD350. Derivation of medicinal drug from plants remain relevant today. 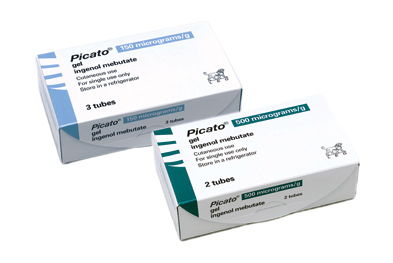 Picato can cause local skin reaction and are transient and typically occur within 1 day of treatment initiation and peak in intensity up to 1 week following completion of treatment. Localised skin responses typically resolve within 2 weeks of treatment initiation when treating areas on the face and scalp and within 4 weeks of treatment initiation when treating areas on the trunk and extremities. Treatment effect may not be adequately assessed until resolution of local skin responses. It is important that when we are dispensing both strengths to our patient cohorts, that we take time to explain that the right strength is applied to the right area.